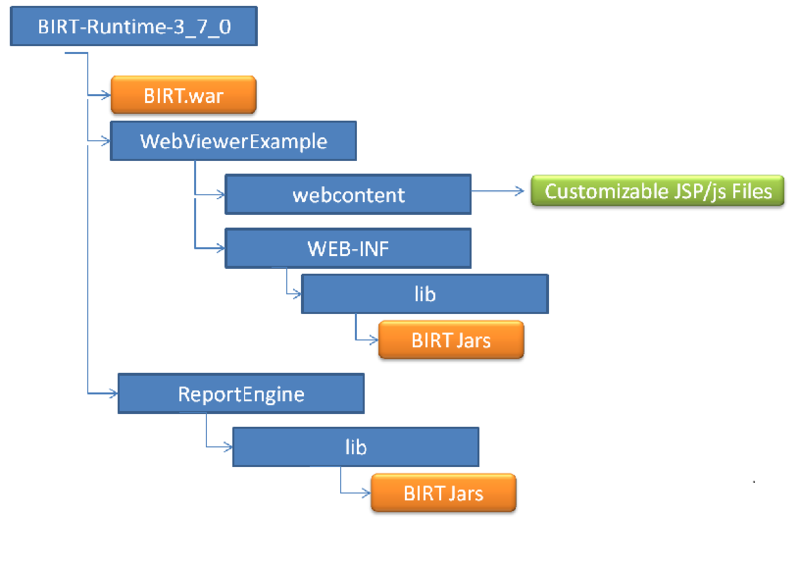 Difference between revisions of "Birt 3.7 Migration Guide"
Adding a JDBC driver to the BIRT designer has not changed, but in the new runtime the driver jar(s) can be copied to <BIRT folder>/WEB-INF/lib. For example, in GlassFish 3.1 this will be in glassfish/domains/domain1/applications/birt/WEB-INF/lib . The Runtime contains the ReportEngine which can be used to run and render reports using the Report Engine API (RE API), and the DesignEngine which can be used to create report, library and template designs using the Design Engine API (DE API). The Runtime also contains the Chart Engine which can be used to build and display charts outside of a BIRT report or to manipulate charts within a design using the Chart Engine API (CE API). The ReportEngine directory also contains a bat file (genReport.bat) or shell script (genReport.sh) to run reports from the command line using the Report Engine API. To use the command line file, extract the ReportEngine directory to a local file location (eg c:\birt3.7). To run a report you must set the environment variable BIRT_HOME first. The shell/bat file uses this to locate the jars. This will produce Hello_World.html in the samples directory. Use the following to get more parameter options. If you have existing code (RE, DE or CE API) that you plan on migrating to BIRT 3.7, no changes should be required, but it is advised to remove the setBirtHome method from your EngineConfig instance. Add all jars in the ReportEngine/lib directory to your classpath or to your buildpath if you are using Eclipse to build your Java application.